Irvin and Judy Baxter and the Endtime Team hopes that your first month of 2017 has been a great start to a wonderful New Year! We have just come through America’s Presidential Election and we were excited to hear the name of Jesus mentioned multiple times at the inauguration. We are binding together in prayer for President Donald Trump and his administration. Please join us and help us pray that God will direct the steps of our nation back towards Him. Together, we can partner to reach our nation starting today! Many of us are very concerned about the direction of the United States of America. Some are predicting its demise. We are happy to announce there is hope for the future of our nation we love so much. The United States and its special role in the future is specifically prophesied about in the Bible. 1 Chronicles 12:32 says, “And of the children of Issachar, which were men that had understanding of the times, to know what Israel ought to do.” Just as the sons of Issachar had understanding of the times back then, you and I can understand them now. If we know what the United States of America should do according to Bible Prophecy, then we have an obligation to shout it from the rooftops. One of the best ways we can do this is by reaching out to the leaders of our country with this amazing message that Jesus is returning soon. Have you ever thought to yourself, “I want to make a difference in the political world by sharing what I have learned about Bible prophecy from Endtime Ministries”? “Where do I begin?” “How can I make an impact?” Endtime Ministries is providing an avenue for you to reach out. Together, we can partner to share the truth, about current events and how they relate to Bible prophecy, with all of our lawmakers. We are believing that we can forever change the direction of our nation! 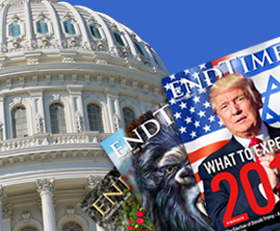 As you are probably aware, Endtime Ministries mails Endtime magazine to every lawmaker/leader in the United States. It is time for them to be renewed. How many lawmakers/leaders would you like to personally be responsible for? We are asking each of our readers, listeners and partners to donate $29 to sponsor a 2-year subscription per lawmaker/leader in this country. With your help, we can spread this Endtime message all across America. Let’s make a world-wide difference together! Help us change America’s future today!